FRESNO, Calif. (May 16, 2018) - Jose Ramirez, the pride of California’s Central Valley, is ready for his world championship homecoming. 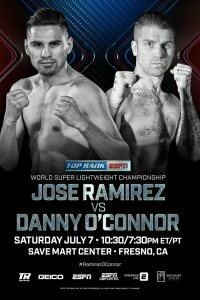 Promoted by Top Rank, in association with Star Boxing and Murphys Boxing, tickets to this world championship event, priced at $150 (floor), 90, $60, $35, $20, and $10, plus applicable fees, are ON SALE NOW and can be purchased online at ticketmaster.com, charge by phone at 800-745-3000, or at the Save Mart Center box office. For more information and box office hours, visit www.savemartcenter.com. "It has been my dream to become a world champion. It's now my duty to defend this belt at home for my city, fans and everything I fight for,” Ramirez said. “I'm blessed to have this opportunity. I dedicate this fight to the immigrants that contribute to and make our society a better place. I'm pro-immigrant and proud."